A surprise discovery leads to a Hanukkah hit. I would like to say that this is the first time I have combined brisket and latkes into one recipe, but I would be lying. I just love finding ways to use brisket, like the brisket latkes I created last year and one of my newer creations: brisket-stuffed cabbage. Like so many great recipes, this one was created by accident. At a Hanukkah party several years ago I served potato latkes, pulled brisket and some homemade challah rolls. Pretty soon my friends ditched the rolls and started topping their latkes with the brisket. And a new star was born. If you are asking yourself, “can I use my family’s beloved brisket recipe for this?” The answer is absolutely. As long as the recipe calls for a significant amount of liquid so that it has a bit of sauce to it, whatever recipe you fancy will work great. 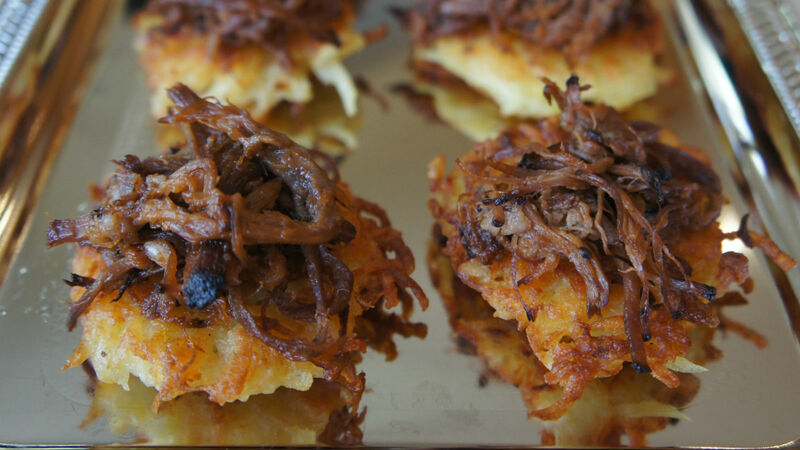 You don’t have to stop with brisket as a topping for your latkes. You can make a “top your own latke” party this Hanukkah season, serving up grilled pastrami, pulled brisket, caramelized onions or any other fun topping you like. 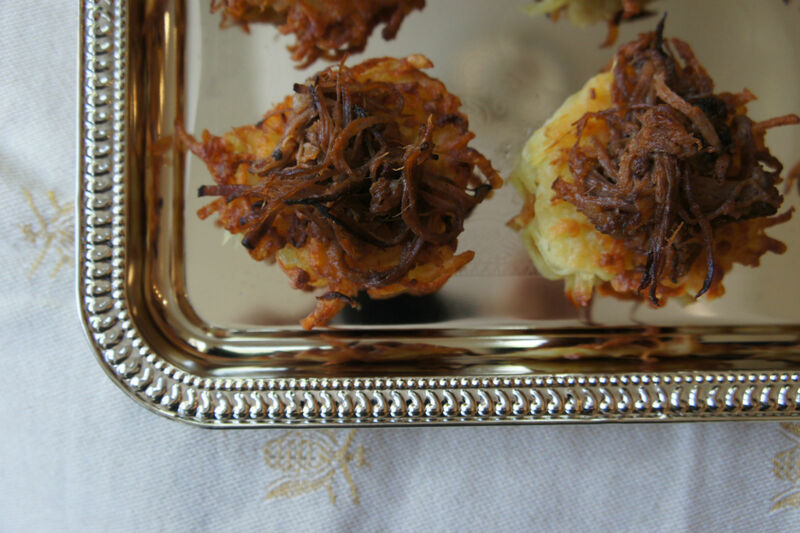 Watch as your guests get creative with their latkes. You can also shake it up by adding some sweet potato latkes or parsnip latkes into the mix. In a small bowl combine salt, pepper, garlic powder, onion powder and parsley. Spread dry rub on both sides of brisket evenly. Preheat the oven to 300F degrees. Heat the olive oil in a large dutch oven or pot on medium high heat. Sear the brisket on both sides “until the smoke detector goes off.” Remove meat and set aside. Using the remaining oil and “good bits” on the bottom of the pan, sauté carrots and onions, scraping the bottom until the veggies are soft, about 8-10 minutes. Add the tomato paste and stir until thoroughly mixed. Put the brisket back in the pan, and cover with the bottle of red wine, beer and ginger ale. Place the entire pot with brisket into the oven, and cook for at least 3-4 hours, until meat is completely tender. When the meat is fork tender, remove the meat and set aside on a large cutting board. Let the sludge rise to the top of the pot liquid and skim it off. Strain out the carrots and onions and using a food processor, blend them with 1-2 cups of the cooking liquid, then return the blended mixture to the rest of the liquid and simmer to reduce slightly. On the cutting board using two forks, carefully shred the brisket into small strands. Add 1-2 cups of the pureed cooking liquid to the pulled brisket for additional moisture and flavor. Serve in a large bowl and allow guests to top latkes, or spoon small amounts of brisket on each latke for a more elegant presentation. Using the shredding attachment of a food processor or a hand grater, coarsely great potatoes, onions and garlic. Place in a large bowl. Add flour, eggs, salt and pepper. Mix thoroughly until completely combined. Allow to sit 5-10 minutes. Drain excess liquid. Heat vegetable oil in a large skillet over medium heat. Using your hands, make a small latke patty and squeeze out excess liquid again. Fry for 3-4 minutes on each side, until golden brown. Remove from pan and place on wire cooling rack placed on a baking sheet, which you can place in a warm oven until ready to serve. If you are looking for an egg-free and dairy-free version of your favorite potato latkes, look no further! Scallions, cheese, sour cream and more! Coconut gives the latkes a subtle flavor and extra crunch.